THIS EVENT IS NOW CANCELLED DUE TO WEATHER CONDITIONS! Art Gene and Natural England will be hosting a joint event at Earnse Bay, on Saturday 13th October, surrounded by our wonderful variety of waders and sea birds, coastal ecology and shoreline disturbances. 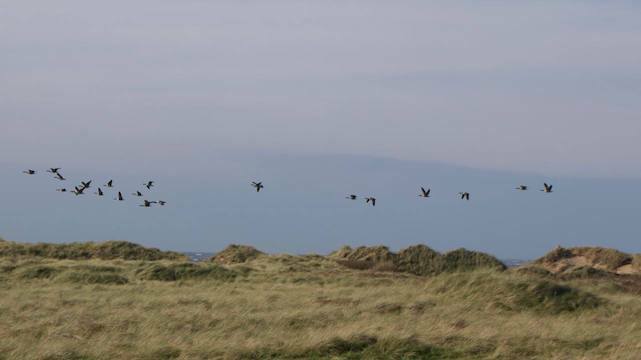 A guided walk will be led by Natural England’s ornithological expert John Osborne, North Walney’s National Nature Reserve Site Manager. Setting off from Earnse Bay car park at 11:00 am, an easy walk will be lead along the coastal path to find the best viewing points. John will share his wealth of experience in identifying waders and other seabirds and will talk out about their fascinating feeding habits as the species get ready for winter migration, finishing at 11:45 pm. Two powerful telescopes will be available to use enabling you to get very good views as the incoming tide brings the birds closer to the shore. Hot drinks provided at the end. Drop-in anytime between 12:00pm and 14:00 pm to our bird watching station at Earnse Bay. Have a chat with Eve Mulholland, Coastal Team Landscape Engagement Coordinator, use the telescopes to view the wading birds and find out information on our coastal ecology and how to protect it. No experience required, just turn up. Easy-to-use identification charts and hot tea and coffee available free of charge. Suitable clothing and footwear should be worn, the birds will still be out in poor weather! Limited spaces are available for the guided walk. Booking is essential. Please Contact John Osborne on 07967 971 523 to book your place. For further information about Art Gene and upcoming activities contact Eve Mulholland, Coastal Team Landscape Engagement Coordinator: email eve.mulholland@art-gene.co.uk or telephone 01229 825085.